We've been watching Jamie Oliver's 30 Minute Meals on BBC America. Yum oh! Felix and Oscar (the doxies) got me the cookbook for Mother's Day! Man my doxies give great gifts, don't they? Anyhoo, tonight is THE night to cook the first 30 minute meal. If I don't burn anything, I will post pics and the recipes to share! Start-to-finish it took me 45 minutes to make this entire meal. My frangipane tarts turned into cookies because the little flower is a doofus! I bought frozen tart shells and they come in aluminum tart pans. I didn't like the look of that so I took them out of the little pans, filled them and shoved them in the oven. After about 10 minutes, I peaked and went . Yup, that's what the little pans are for! Who knew? 20 minutes to defrost the tart shells (he used store bought ones but not frozen, couldn't find those). Time to boil the water in my tea kettle. He uses an electric one. I couldn't find the red Thai chili's he uses so I used serrano chilis. I did remove the seeds and membranes and, honestly, it was not hot at all! I substituted Splenda for Baking for the superfine sugar he calls for in his recipe for the tarts. Gotta cut back the sugar somewhere for the boy, ya know? If anyone is interested, I will be happy to post the recipes. According to East Texas "That was the best thing I ever ate!" As Jamie would say "Brilliant!" BlueBonnet why is your table so bare?!? where is your doilies? That's terrible! 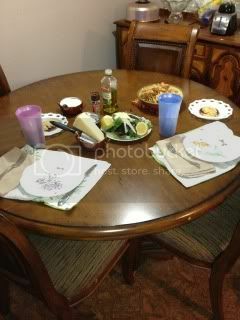 Well it's not my table but that is the amount we eat at night!!!! I always get the stuff that's used by date is in three days and we eat like kings!!! As nights get nippy, take comfort in a hearty casserole, perfect for warming up your midweek, without breaking a sweat! Preheat oven to 160°C. Measure and prepare all your ingredients. There is much confusion about the difference between a casserole, a stew and a braised dish. These three terms are often used indiscriminately as they all refer to cooking food slowly in liquid in a covered container. After much research, I came to the conclusion that for a casserole, as it is most universally recognised, the food (namely meat) is browned first on the stove top and then simmered with other ingredients in the oven. For a stew, the food is not browned first before it is simmered on the stove top. To braise, the food is browned first and then simmered on the stove top. Usually, less liquid is used when braising. To cook the casserole, you will need a large, heavy-based ovenproof saucepan or flameproof casserole dish with a lid. An enamelled cast iron pan is ideal as it can be used on both the stove top and in the oven and distributes and holds heat well. There are also many suitable flameproof casserole dishes made of earthenware, glass or ceramic available. If you don't have a saucepan or casserole dish that can be used both on the stove top and in the oven, don't worry. Just transfer the mixture from one to the other after bringing it to the boil in step 5. Heat 2 tsp of the olive oil in a large, heavy-based ovenproof saucepan or flameproof casserole dish over medium-low heat and cook the bacon for 3 minutes. Add the onion and cook for 5 minutes or until the onion is soft. Add garlic and cook for a further minute or until aromatic. Remove the bacon mixture from the pan/dish and set aside. Add 1/2 the remaining oil to the saucepan or casserole dish over medium-high heat and cook 1/2 the beef for 1-2 minutes, tossing occasionally, or until browned. Browning the meat will start to develop the flavour as well as add colour to the casserole. Sprinkle the meat with 1/2 the flour and cook for a further minute. The flour is used to thicken the sauce as it cooks. If you don't cook the flour at this stage before adding the other ingredients, an unpleasant raw or floury flavour will be left in the casserole. Remove the beef from the pan/dish and set aside. Repeat with the remaining oil, beef and flour. Remove the beef from the pan/dish and set aside. Add the wine to the pan/dish and bring to the boil over medium-high heat. Cook for 1 minute, scraping the base with a wooden spoon to dislodge any residue left on the base of the pan/dish. The tasty bits that have accumulated on the base of the pan/dish are incorporated into the sauce in which the meat and vegetables will be cooked, thus adding to the flavour of the casserole. Return the onion mixture and the beef to the pan/dish. Add the stock, mashed tomatoes and carrots, and stir to combine. Bring to the boil over high heat. Cover the pan/dish and cook in preheated oven for 2 hours or until the beef is very tender. An oven temperature of 160°C will ensure the casserole simmers steadily. It is important that it doesn't boil rapidly as the meat will become very tough and stringy. Long, slow cooking of the casserole ensures that the meat is tender and the sauces develop a full-bodied, rich flavour. The main advantage of cooking a dish like this in the oven, as opposed to on the stove top as with a stew, is that there is no chance of the ingredients sticking and burning on the base of the pan/dish. 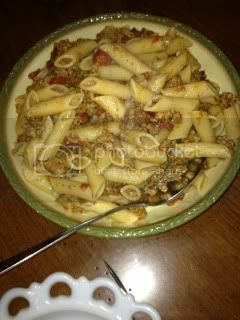 Remove the pan/dish from the oven and use a large metal spoon to skim any excess fat from the surface of the casserole. Season with salt and pepper and then stir through the parsley. Serve with boiled or mashed potato. Casserole is also the term applied to the covered dish in which food is cooked slowly in the oven. To avoid confusion, we refer to it as a casserole dish in this article. Cuts of meat that are suitable for use in a casserole are those which benefit from long, slow, moist cooking. Beef chuck steak is a good cut to use. It is a tough, less expensive cut of meat with much connective tissue that will soften and become tender if simmered gently over a long period. Even though this connective tissue softens, it will still hold the meat fibre together so that it doesn't disintegrate. Meat cuts like fillet, rump and sirloin are unsuitable as they have little or no connective tissue and will fall apart if cooked in this way. Another advantage of using inexpensive cuts of meat is that they are usually more flavorsome. No doilies in the States, mate! I usually put a lace tablecloth on the table for Sunday dinner. There are just two of us so placemats and napkins are for us. Thanks for sharing the lovely recipe! I've copied it and added it to my file. Sounds yummy for sure! I need to update this as I've been cooking more of the book! No pics this time - sorry. the kettle, for topping up, if needed. tomatoes (300g). Whiz to a paste, then add a lug or 2 of extra virgin olive oil. Taste and season if needed, then put aside. the pasta. Add a splash of water to make it silky and loose. cherry tomatoes and basil on to and take to the table. splashes of balsamic vinegar and a couple lugs of extra virgin olive oil. and crush over ½ a peeled clove of garlic. Toss together and take to the table. 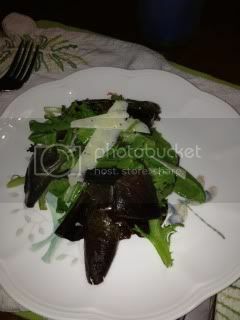 Rocket salad - this is arugula and it is awesome! Put the rocket into a bowl. Use a speed peeler to shave the parmesan over. then season to taste. Take the salad and dressing to the table. He also has a Limoncello kinda trifle to go with it but I didn't make it. 1. Squeeze the juice from 3 oranges into an appropriately sized serving dish. Stir in the limoncello and taste to check the balance of sweetness and booze, adjusting if necessary. 2. Cover the base of the dish with a layer of sponge fingers. 3. 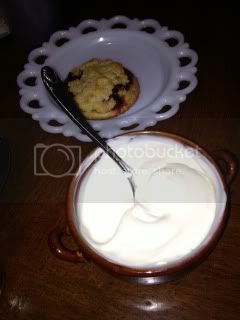 Put the mascarpone and icing sugar ino a separate bowl with the milk. 4. Finely grate over the zest of the lemon, then squeeze in the juice from one half. Add the vanilla paste or extract to the bowl and whisk well. 5. Spread the mixture all over the sponge fingers, then scatter over the raspberries and finely scrape over a little dark chocolate. Put into the fridge. 6. After dinner take the dessert out of the fridge. Serve over a little icing sugar, then serve. If you’re feeling a bit indulgent you can melt the rest of the chocolate in the microwave and drizzle it over the top. I made half the pasta but all of the sauce for Tuesday night. I refrigerated the leftover sauce and made the rest of the pasta on Thursday. Still awesome! Oh and there was a loaf of ciabatta bread, sprinkled with olive oil, salt and thyme. You just preheat the oven to 350 degrees F and plop it in the oven while the rest of the meal cooks. I must be getting faster because I did, indeed, cook the meal in 30 minutes. I cooked the raspberry tarts again - see recipe above. Yummmm - we love them. Tonight, East Texas cooks the book! But we are having watermelon instead of mango for dessert. Can't abide mangoes after living in Venezuela for so long. Blech! I also could not find the paneer cheese so I bought Queso de Mano. Went to the Farmer's Market today looking for the guy who sells fresh naan. Sadly, he was not there so we went to an Indian grocery store for the first time. Waaayyyyyy cool! I didn't know what 98 percent of the food was, but I found the paneer cheese for next time. They also had fresh naan! Whoo hoo! They had English foods as well - Bisto, Coleman's mustard (not just the dry), ginger biscuits , etc. ,etc. Loved it! They were very nice to us and answered a TON of questions. I will definitely be back. Edited to add: Forgot to take pics before we chowed down. It was really, really, really good and I am stuffed!